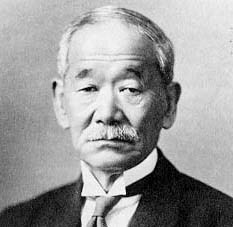 Modern judo (the way, do, of gentleness or suppleness, ju) was developed by the efforts of Dr. Kano Jigoro (1860-1938) from a fusion of the various techniques and schools of ancient jujutsu, which eventually came to form the Kodokan (School for the study of the Way). Following the rise of the Kodokan dojo, Dr. Kano’s judo has spread the world over, even reaching the heights of the 1964 Tokyo Olympic Games. Today, judo is practiced as both a martial art and a sport. Judo players engage each other utilizing various methods of throwing (nage-waza), pinning (osae-waza), strangulation holding (shime-waza), and dislocation techniques (kansetsu-waza). The fundamental principle underlying the application of judo techniques is ju, the idea being that the supple, flexible, and adaptive judo player is superior to the player who tries to overcome his adversaries through strength alone. In the broader sense, the principle of ju applies to life outside of the dojo, for the person who is adaptive, flexible, and resourceful in life, the person who can “push when pulled” and “pull when pushed”, will find greater fulfillment than the person who tries to overcome life’s obstacles through the force of their will alone. The practice of judo is succinctly summarized by its two principle maxims, “maximum efficiency for the energy expended” and “mutual welfare and benefit for all”. The ultimate aim of the judo practitioner is the harmonious development of mind and body and to use one’s training for moral and ethical advancement.